Now, more than half of UK company equity is owned abroad and only just over 12% by individuals. The interests of those who own Britain’s businesses are often misaligned with those of other stakeholders, such as employees, customers, service users and local communities. And even were they are better aligned, a concentration of shareholding and the distant power of capital markets hollows out the agency of individual shareholders. A different kind of business and, as a result, a different kind of economy is possible, but it will not happen by accident. Co‑operatives are both journey and destination in this quest. They are a vector for democratic change in the economy, and a more democratically-owned economic model that distributes wealth and is viable today. And yet a lack of policy and support, and a hostile economic environment for co-operation in the UK, holds them back. 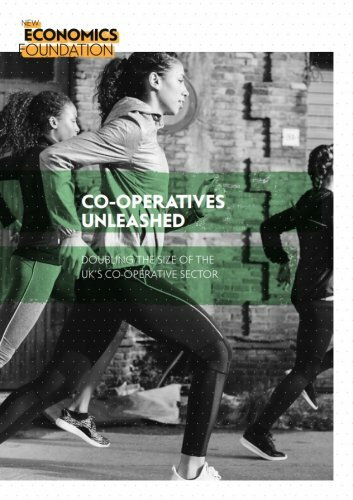 This report is about doubling the size of the UK’s co‑op sector. It is also about how enterprise can serve the interests of the people it employs and those in the communities around them. And it is about how doing business can increase economic democracy, and how the wealth created can be more broadly and equitably shared.